The huge flowers and leaves of Ashe magnolia make it one of my favorite native flowering trees. Individual flowers may be 6 – 12 inches in diameter and are white with purple blotches at the bases of the 3 inner petal-like tepals. When in flower, as they are now in April, the huge white blooms are impossible to miss because of their size and color. Ashe magnolia. Photo credit: Gary Knox, UF/IFAS. The leaves are similarly huge, growing 1 – 2 feet long and up to 1 foot across. These large, banana-like leaves offer interest and coarse texture to any landscape. Ashe magnolia grows as a small tree with a loose, open branching habit up to a height of about 25 feet. The large, light green leaves have whitish undersides and emerge in mid spring prior to flowering. Leaves turn yellowish and fall in autumn, usually without any dramatic color change. Pollinated flowers are followed by reddish, cylindrical, 3-inch fruits producing bright red fleshy seeds in early August. Native to the Panhandle. This small tree is relatively unknown because of its rarity. 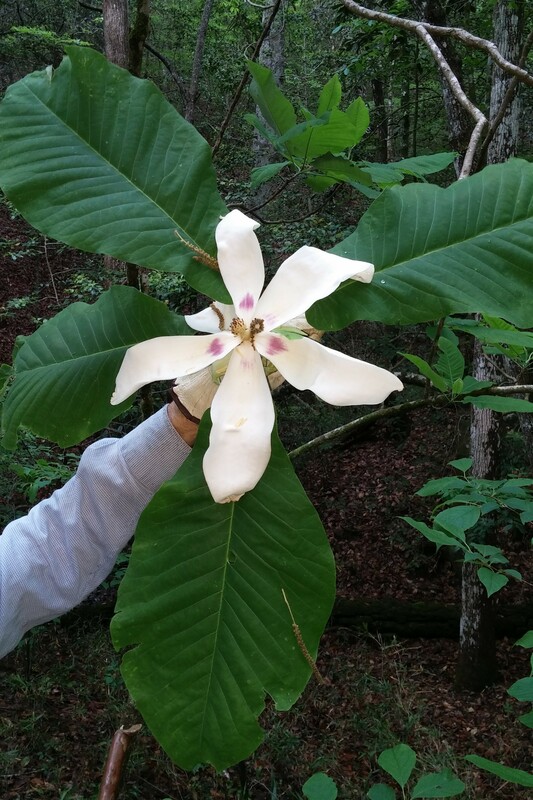 Ashe magnolia, Magnolia macrophylla var. ashei, is native in only a few counties in the Florida panhandle and is endangered because of this limited distribution. It is primarily found on the slopes of ravines, growing in the understory of mixed hardwood forest. While it is now illegal to remove this plant or its seeds from the wild, nurseries can grow this plant using seeds from long-cultivated landscape trees. Garden cultivation. Ashe magnolia makes a lovely small flowering tree if planted in the right location. It grows best in rich, well-drained soil under partial shade, although full sun is tolerated if plants are irrigated during drought. Sheltered sites are best since strong winds can shred the papery leaves and break the brittle branches. You won’t have to wait long for this plant to flower; a unique aspect of Ashe magnolia is that it flowers when young, reportedly when as small as 1 foot tall! Another unusual characteristic is that this Florida native plant is hardy north into USDA plant hardiness zone 6. Given this species’ beauty, rarity and nativity to the Panhandle, I think it is almost an obligation for panhandle Floridians to cultivate and showcase this plant in our gardens while preserving it in our forests! Seek out specialty nurseries to obtain one of these rare beauties for your garden.